IBM Commerce Module for OmniFind Discovery Edition integrates IBM OmniFind Discovery Edition with IBM WebSphere Commerce. The integration helps online retail and catalog companies convert shoppers into buyers by making it easier for people to find the right products and services that match their specific requirements from the Web. 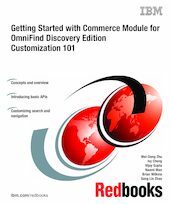 This IBM Redbooks publication provides an introduction to customizing the Commerce Module for OmniFind Discovery Edition using OmniFind Discovery Edition APIs. We introduce some of the basic APIs and show examples of using them to run simple searches, refine search results, and navigate within the search results. Using a sample start store as the case study, we explain how to use the APIs to add or modify existing menus and navigation options and change the appearance and behavior of the existing sample store Web site. We show you how to work with OmniFind Discovery Edition search engine and pass multiple constraints to narrow searches for the online store. This book is intended to be used by system integrators and solution developers who will be working with the Commerce Module for OmniFind Discovery Edition and performing customization for the online stores powered by OmniFind Discovery Edition.